Note: This page is a WIP and subject to regular changes and updates. First let’s define a regular shaped room, it’s one where all corners of the room are 90°or thereabouts. It could be a square, a rectangle or otherwise. You can start to minimise any errors, by carefully selecting your start point. The first question to answer is do you have external survey control? External Survey Control: If you have (or will have) external survey control, when selecting the first wall to measure in a regular room, select the wall that is linked to your survey control or the longest wall that is most closely linked to your survey control rather than an internal wall to help minimise any errors. No External Survey Control: If you will not have any external survey control, the halls and corridors will become your control; your branches and structure on which to hang the survey. The key is to minimise the number of times you measure from room to room, ideally no more than 3 rooms down. Select the most central point to start your survey along the longest wall and work from the inside to the outside. 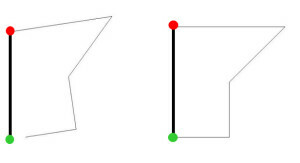 Direction of measurement and selection of first point: The room needs to be measured in a clockwise direction so the selection of the first vertex point and the direction of the first wall from it is important. The first wall of a room forms the baseline for any computations and will not “move“, everything swings from it. 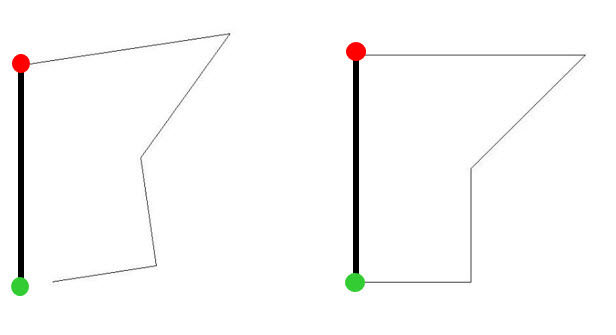 Its length may change in an adjustment but the orientation will not change. To help minimise errors select the longest wall if no external survey control or the longest wall most closely linked to external survey control.